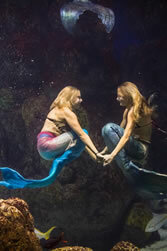 Mermaids… to most, they're the subject of myth and legend, but at Downtown Aquarium we've got our own sea of mermaids! Mark your calendar for our next event on Saturday, March 2 at 8:30am & 9:45am. Must call to reserve your spot! Meet and greets held after Under the Sea shows, unless otherwise stated. Mystic Mermaid shows may be canceled without prior notice and not updated immediately on our website. Please call +1 (303) 561-4444 before your visit or check out our Facebook page for latest updates. Our mermaids swim 1-4 shows per day. 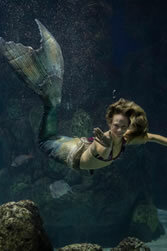 Mystic Mermaids are all scuba certified, CPR certified and trained on emergency water evacuation rescue. The water is a temperature of 74 degrees. The mermaids free dive, with no weights, no underwater air supply and no goggles. Salt water is impossible to see in, so the mermaids are trained to do their entire performance without clear vision! The Mermaids current routine is a performance geared toward children. The show has conservation messages teaching kids how to care for the ocean and about recycling.